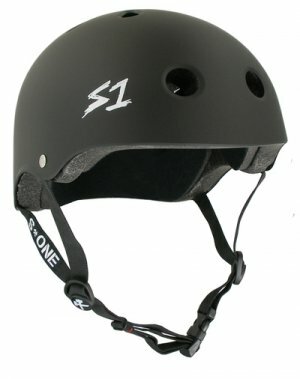 ﻿ S1 Lifer Dual Certified Helmet - Black Matte - $60.00 : Bruised Boutique, For Derby. By Derby. The S1 Lifer Helmet is designed to fit low on the head like a traditional soft foam skateboard helmet. This helmet is a break through design combining the added safety of a CPSC and ASTM certified helmet with the comfort and fit of a soft foam helmet. -Designed to protect against multiple small impacts and one big impact. -High Impact (Hard) EPS Fusion Foam Mold. -Fits low on the Dome. -5 x Safer than a Soft Foam Helmet. Fits head sizes: "21 - 23.5"
S-1 Strap colors may vary.